Real-time strategy implemented by the Black Hole Games development team, which consists of great fans of RTS ideas, including some of the best Starcraft players in the world. Worlds collide in Armies of Exigo, a fantasy RTS where the boundaries of the battlefield are broken and war is waged both above and below the ground. This game takes strategy to new depths as elves, beasts, knights, and creatures of the darkness are locked in an epic battle for survival. In the world of Exigo, where peace and prosperity have reigned for years, the empires of man and beast faces their greatest threat yet. A sinister force known as The Fallen has awaken to strike where the inhabitants of this world least expect - from underground. Users will take control of massive armies, wage wars in the forests and river valleys of the surface, then descend into the caverns and catacombs of the underworld to face off against the dark evil. Armies on all sides will have the ability to delve deep underground to travel unseen by foes or borrow up to the surface to unleash powerful attacks on unsuspecting enemies. The gamer must devise never before deployed strategies for combat and defense as attacks can come from all directions. Conquer as the heavily fortified Empire and control an army of knights, dwarves, elves and gnomes. Ravage the plains with the nomadic Beasts, leading tribes of ogres, trolls and other fantastic creatures. Emerge from deep to consume the world of light with The Fallen – a powerful force of dark elves, fallen warriors, swarming insects and other horrific creatures of the dark. Engage in an epic three-part single player campaign and save the world of Exigo from the evil that threatens to plunge the world into darkness. 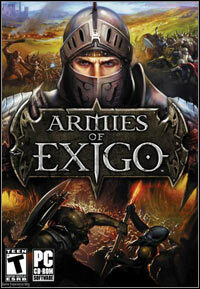 Or go online for massive multiplayer skirmishes with up to eight players striving to conquer the surface and underworld. Success can only be achieved through a balance of military might and strategic alliances. * Control any of three different armies: The Empire (knights, wizards, elves), The Beast (ogres, trolls, lizardmen), and The Fallen (dark elves, fallen knights and creatures of the deep). * Wage war on two fronts simultaneously – above and below the surface – with a unique dual layered map system. * Stunning 3D visuals bring the characters and environments to life. * Immerse yourself in a fully interactive world: Blow up bridges, create avalanches to take out your enemies, cause subterranean lava flows to erupt aboveground, and dig tunnels from the surface into the caverns below. * Engage the enemy with an army of up to 200 units for massive real time battles. * Change the landscape of both the surface and underground by deploying units, such as Miners, and casting spells, such as Earthquake and Volcano. * Single-player includes a three part campaign and skirmish mode to battle computer-controlled players. * Go online and play in one of four multiplayer modes: Melee, King of the Hill, Mission, and Free-for-all. Game score 8.21 / 10 calculated out of 1338 players' votes.